Russia's Presidential Election Observers Were Pressured And Intimidated : The Two-Way Before and during the election, observers said they were targeted. Vladimir Putin won a fourth term. A billboard in St. Petersburg, Russia, shows an image of Russia's President Vladimir Putin in January. The sign says, "Strong president — Strong Russia." As Vladimir Putin won a fourth term on Sunday, reports have surfaced of election observers being harassed and intimidated that day and in the days leading up to the vote. 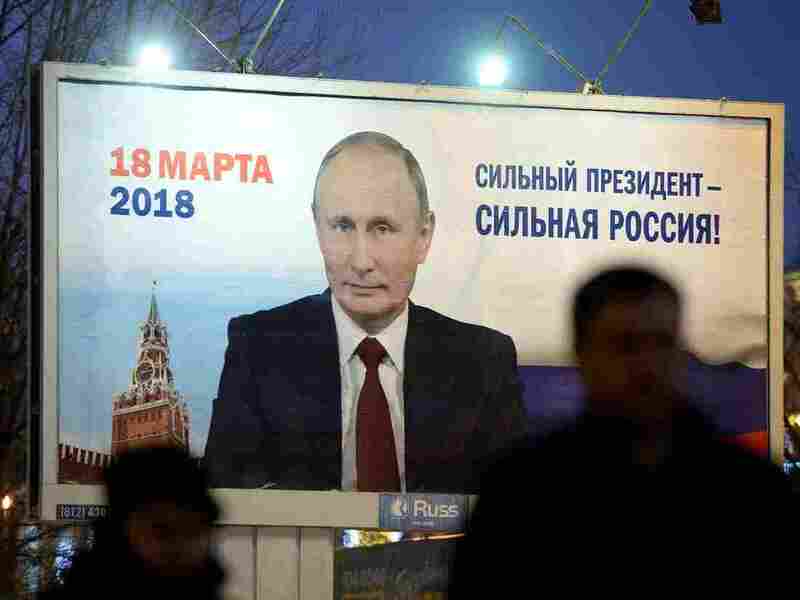 More than 1,300 foreigners reportedly served as election monitors in the presidential election, which took place on March 18 and yielded a predicted win for Putin. Many observers came from places and political backgrounds that are friendly to the Russian government in an attempt "to create an international stamp of approval for the vote," reported The Guardian. Sputnik, a Kremlin-backed news outlet, reported that observers judged the election to be "fair and transparent." But numerous independent media outlets found observers who said they saw violations. A month before Russia's presidential election, observer David Kankiya was informed by the police that his car might have been used to commit a crime, Reuters reported. He was detained, charged with disobeying police and sent to jail for five days. "I was detained and charged on a false pretext," Kankiya told the news agency. "It's political pressure." Police say Kankiya didn't produce identification during a routine check. As the presidential election drew closer, Kankiya's car tires were slashed and pro-Kremlin journalists accosted him in two separate incidents, he told Reuters. Kankiya is a coordinator at Golos, a nongovernmental election watchdog that was labeled a "foreign agent" because it received foreign aid. Volunteers from Golos — a word that translates to both "vote" and "voice" — say when entering or leaving Russia, they are often stopped by border staff who accuse them of having terrorist links, according to Reuters. Before the election, a Golos representative told The Guardian that police ripped up a contract to lease office space. The location was supposed to be a call center to receive reports of election violations. The representative said that police officers threatened the landlord of the building: "You shouldn't hold this event here or you'll have trouble." The Russian government denied involvement. Police also attempted to stop activist observers from visiting polling stations, The Guardian reported. The officers raided headquarters of opposition figure Alexei Navalny, who was banned from the election, and they tried to seize documents that would give observers access to polling locations. By the end of the day, Golos said it had registered more than 1,500 violations. There were ballot boxes that had papers in them before polls officially opened and video footage of ballot boxes being stuffed, according to Golos. There were also reports that concerned the treatment of observers, including denying them access to polling stations, restricting them from taking photos and videos, limiting their ability to move around premises and removing them from polling stations. The Organization for Security and Cooperation in Europe, which requested 420 short-term observers to monitor polling stations, voting, ballot counts and results, will issue a final report of the entire electoral process in about eight weeks. At a conference in Moscow on Monday, an OSCE election monitor described the presidential election as "overly controlled." "Where the legal framework restricts many fundamental freedoms and the outcome is not in doubt, elections almost lose their purpose," said Michael Georg Link, director of the Office for Democratic Institutions and Human Rights who led OSCE observers.